this massive red-brick theatre hosts the smash hit Harry Potter and the Cursed Child. We recommend taking public transportation to the theatre. The nearest underground stations are Leicester Square Station (Northern/Piccadilly Lines) and Tottenham Court Road Station (Central/Northern Lines). The Palace Theatre is also serviced by bus lines 14, 19, 24, 29, 38, and 176. If arriving by train the nearest rail station to the Palace Theatre is Charing Cross Station. If driving to the theatre the nearest car park is the Q-Park Chinatown. The Palace Theatre, London, is an imposing red-brick building that dominates the west side of Cambridge Circus. Commissioned by Richard D'Oyly Carte in the late 1880's, it was designed by Thomas Collcutt. D'Oyly Carte intended it to be the home of English grand opera, much as his Savoy Theatre had become the home of light opera with the Gilbert and Sullivan series. The foundation stone, laid by his wife Helen in 1888, can still be seen on the facade of the theatre, almost at ground level to the right of the entrance. The Royal English Opera opened in January 1891 with Arthur Sullivan's Ivanhoe. No expense was spared to make the production a success, including a double cast and "every imaginable effect of scenic splendour" (Hesketh Pearson, ''Gilbert and Sullivan''). It ran for 160 performances. However, this was not enough to sustain the venture and D'Oyly Carte sold the theatre within a year, and it was renamed the Palace Theatre of Varieties. The name was changed to The Palace Theatre in 1911. On March 11, 1925 the musical comedy No, No, Nanette opened at the Palace Theatre starring Binnie Hale. The run of 665 performances made it the third longest running West End musical of the 1920s. The Palace Theatre was also the venue for Fred Astaire's final stage musical Gay Divorce which opened there on November 2, 1933. The last years of the twentieth century saw two exceptional runs for The Palace tickets: Jesus Christ Superstar and Les Misérables. The latter ran for eighteen years, having transferred from the Barbican Centre on December 4, 1985. The show is still running at the Queen's Theatre just 100m further up Shaftesbury Avenue, having transferred in April 2004. Following the transfer of Les Miserables, the theatre was greatly refurbished, marble walls uncovered, restored, repainted, fired with new chandeliers, cleaned etc. This was followed by a short 6-week season of illusionist Derren Brown following his successful UK tour. Andrew Lloyd Webber's The Woman in White received its world premiere at The Palace Theatre, London, on 15 September 2004 and ran for 19 months to 25 February 2006. The show starred Maria Friedman and Michael Crawford originally with subsequent casts including Ruthie Henshall, Michael Ball, Anthony Andrews, Simon Callow and David Burt. 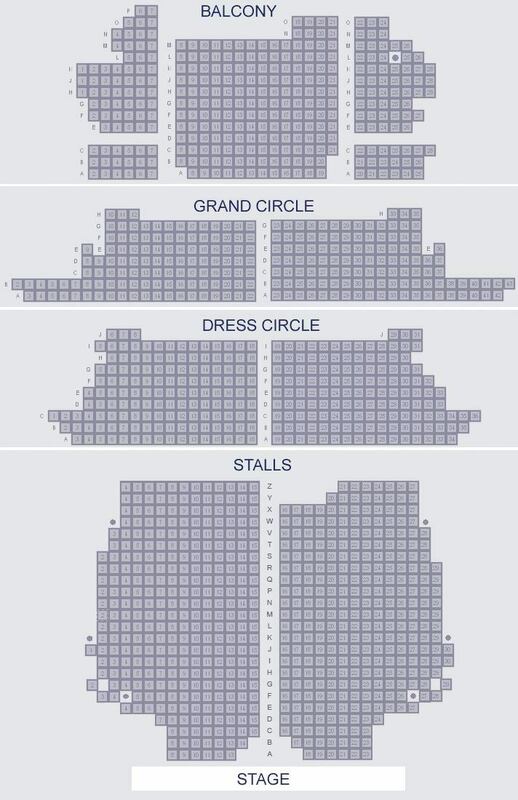 The Palace Theatre seats 1,400 across 4 levels: Stalls, Dress Circle, Grand Circle, and Balcony.